Summer is an excellent time to develop dance technique, as students are not distracted with the stresses of school. 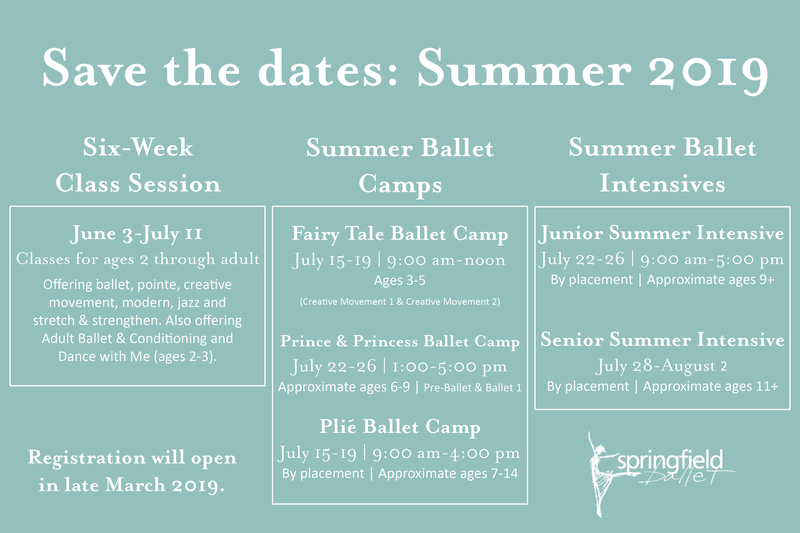 Springfield Ballet is pleased to offer summer camps, a summer intensive, and classes which allow students to continue their ballet training while enjoying their summer break. New to Springfield Ballet? Complete our Pre-Registration Form to help us assist you in proper placement, here. Springfield Ballet offers summer camps for all ages of dancers. For the youngest dancers, Fairy Tale and Prince and Princess Ballet Camps allow children to experience dance class as well as learn about other artistic aspects that are a part of ballet such as music, drama, and dance history. Dancers will have a dance class, craft time, story time, and more each day in these week-long camps. Older dancers may participate in the Plié Ballet Camp. Daily ballet technique class is taught as well as classes in other dance styles (previously taught styles include modern, jazz, character, musical theatre and Irish), stretch and strengthen, nutrition, anatomy and physiology, dance history, and more during these week-long, full day camps. Each camp and intensive concludes with a performance and special presentation by the dancers for their parents and guests. dance and dance-related instruction each day. Curriculum includes classical & contemporary ballet, modern dance, Pilates, jazz, stretch & strengthen, pointe and variations/repertoire, and frequently a guest instructor(s) is brought in to teach portions of the summer intensive. Past guest instructors include Chris Lingner (Indianapolis Ballet), Ken Braso (Missouri Contemporary Ballet) and Charlotte Hart (University of Oklahoma). The summer intensive also concludes with a performance and special presentation by the dancers for their parents and guests. Springfield Ballet’s six-week class session mirrors the sessions offered in both fall and winter/spring. A condensed class session allows students to continue their training during the summer, while still allowing time to rest and enjoy summer vacation. Taking several weeks off from classes can be detrimental to a dancer's ability to maintain and progress technique, especially once the dancer reaches intermediate and advanced levels of technique. To help with this, we offer Stay-in-Shape classes for our Ballet 4 and up dancers before and after the summer six-week session.